Anyone who has ever invested in the stock market has seen this disclaimer: Past performance is no guarantee of future success. Yet when we invest our resources into a well-trained horse, we expect a guarantee that the way he is today, in his current reality, is the way he will be a month or a year from now. I wish I had a dollar for every person that has told me that the horse they bought was misrepresented to them by the seller in some nefarious way, “Surely, he must have been drugged when I rode him before purchase!” The horse was perfect at the trainer’s barn then a “different horse” as soon as the check cleared and the trailer parked at his new home—or so the new owner believes. The truth is, a horse’s training can unravel quickly when he is mishandled or when his life-circumstances change—like when he’s in a new home, around new humans, in a new herd, getting used to a new training regime. These are considerable stressors for a horse and he’ll act much different in the new setting. If a horse was in a regimented training barn or with a trainer and suddenly doesn’t have to obey rules, he may challenge the new order and act up in the new setting. “Anti-training,” or teaching the horse the wrong thing, is quite easy to do. And since horses are extremely fast-learning animals, he can learn the wrong thing the very first time you make the mistake. A common example is circling a horse when he throws a fit about leaving the barnyard. The moment you turn him toward the barn, you have reinforced his fit. It doesn’t matter that you circle back away because he knows how to fix that, he just throws another fit so you’ll circle him again. Even a well-trained horse can be anti-trained in short order. I would like to say that it is easy to un-train a horse, but the truth is, you cannot unlearn information. Once a horse knows something about you (that you won’t enforce the rules, you will not discipline him even when he deserves it, you won’t make him work if he threatens you, you won’t push if you get scared), he knows it. The only thing you can do is change you. I remember selling one of our horses to a good friend, a number of years ago (and we are still friends). Dodger was an admittedly quirky horse–although a very well-trained ranch horse—an experienced pro in all matters of ranching. He lived 13 years as a working horse on a big ranch in Texas, then two years on my ranch, then we sold him and he was taken to live in the city of Denver (an old part where horses were still allowed). Poor Dodger thought he had landed on another planet and was understandably nervous in his new urban setting. But what happened on the first day there, set some serious unraveling in motion. Dodger was not happy in his new box stall and when she went to get him out the next morning to head to turnout, he plowed right over the top of his new owner– forcing her out of his way. How she handled that moment was critical to setting the tone of their brand new relationship. Instead of scolding him and backing him up and insisting that he remember his manners and be respectful and patient, she felt sorry for him (“he was nervous in his new home”). She decided to overlook his momentary indiscretion. But the next day, he did the exact same thing (of course), since apparently the rules in this strange new place were different than what he had known all of his life. Soon, he was pushing all sorts of boundaries and making up his own rules. When I called a week later to see how my old horse was getting along with his new owner, I was appalled to hear how badly he was behaving! Turns out one thing led to another and in just a few days this perfectly mannered horse had become an ill-mannered pig on the ground. We talked it through and I told her what to do to fix it. In short order, Dodger turned back into the horse he knew how to be. What horses want most is the safety and the comfort that the herd provides them. Life in the herd involves respecting authority, following rules and routines, earning the acceptance of the leader and being treated fairly. Well trained horses in particular, tend to be handled in a strict regimen and worked daily, living up to the high expectations of the trainer. Horses love structure, routine and sameness; it makes them feel safe. Horses crave and worship leadership, so going from a strong leader to a passive one is a change any horse would notice. You cannot buy respect from a horse and you cannot buy a relationship with a horse; you can only earn it. Horses in transition to a new owner and a new home, need time to adjust to and get comfortable with their new surroundings and new handlers. It is unreasonable to expect all horses to perform at the same level in a new place with a new rider. But it is important to start your new relationship off with structure and to build your horse’s respect and trust. All my friend had to do was scold Dodger and spend 10 minutes doing some groundwork to remind the horse that he had rules to follow and authority to respect. And that if he acts the way he is trained to act, things will be safe and predictable for him. Right away Dodger snapped out of his bad manners and after taking the time she needed to establish a meaningful relationship with the horse, one he could trust, he reverted back to his old trained self. 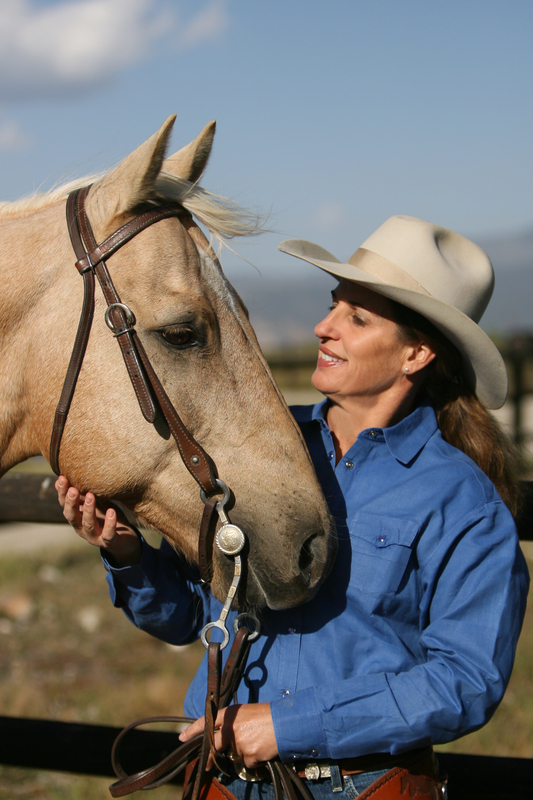 When starting a new relationship with a horse, make sure you get off on the right foot and build a relationship based on trust, respect and authority. This is easily gained through round pen and lead line work from the ground, if you follow a systematic approach like I outline in my From the Ground Up series. If you don’t know how to do effective ground work, get help; enlist the services of a trainer. If you buy a well-trained horse, it is probably worth getting lessons from the trainer, to protect your investment. The best trainer in the world can train a horse to do almost anything for him, but he cannot train him to do it for you. You would have to build your own relationship with the horse, learn his cues, make your expectations/intentions/determination/capabilities clear to him and then lead in a way that makes him want to follow you. That may take an hour or a month or a year—that depends on you, not on the horse’s past performance. You and only you are responsible for the investments you make and past performance is no guarantee of future success. But if you are smart, aware, take responsibility and give guidance, your investment should grow. Treat any new relationship with your horse as a serious investment; be smart and accept responsibility for your own actions and make sure your investment is growing. I have bought 6 of Julie’s DVDs and love them. I am always ready to watch her instructional shows each week on rural TV.